The Best of Morocco with Trafalgar was mysterious, alluring and a fantastic trek through old and new. It was cosmopolitan at times, contrasting with simple, indigenous, nomadic Berber culture. 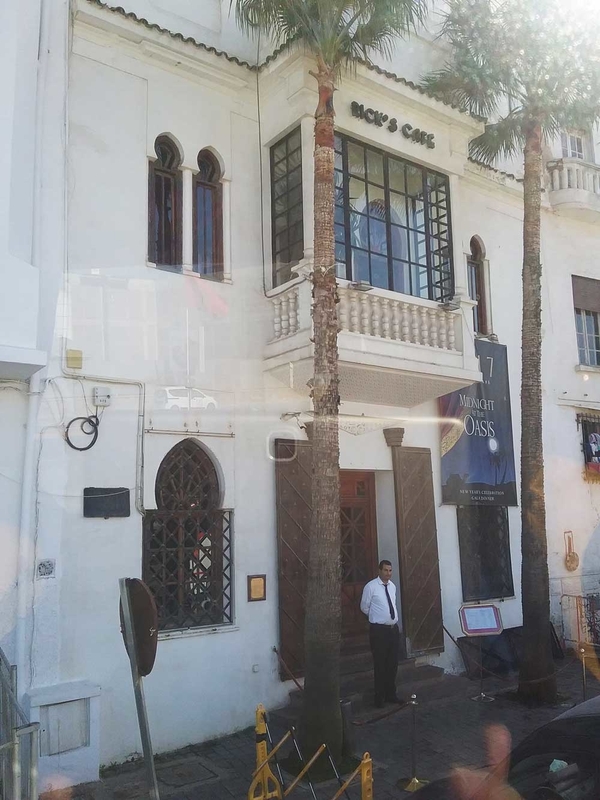 Our adventure began upon arrival in Casablanca with a superb Welcome Reception and fabulous Moroccan cuisine at our hotel. There, we met our Trafalgar Tour Director, Xavier, and our Moroccan National Guide, Mo. 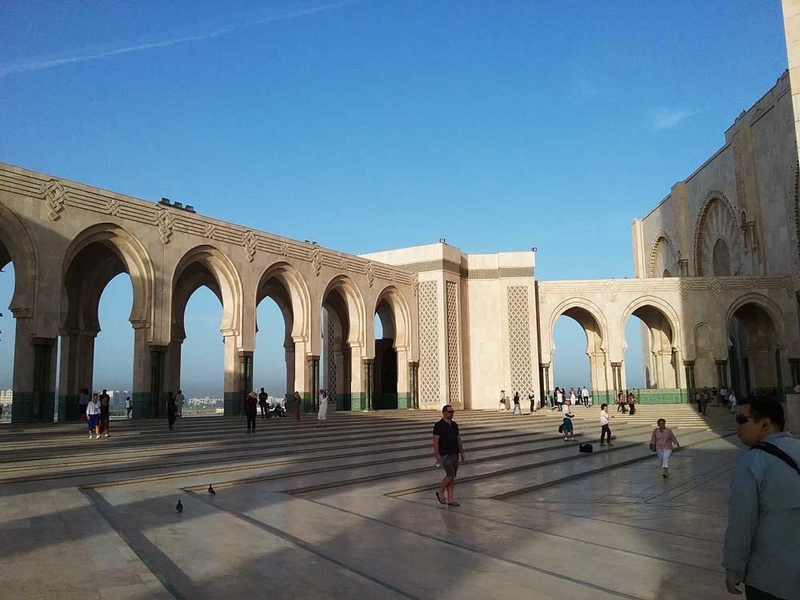 The next morning, we started our tour at the plaza complex at the Hassan II Mosque, built for the late king’s 60th birthday celebration. The imposing setting on the edge of the Atlantic Ocean offers the wonders of the world before your eyes—man’s creative design and architecture with spiritual views of sky and ocean. The mosque and outside grounds can hold 80,000 people. King Hassan wanted his people to be able to pray over water so part of the mosque is built over the ocean and has a clear floor for viewing beneath you when in prayer. Another part of the mosque has a retractable roof so the people are able to pray under the stars. This was just the beginning of seeing the beautiful Moroccan architecture. Related: Experience The Culture Of A Destination With Trafalgar. View Discounted Itineraries Here! 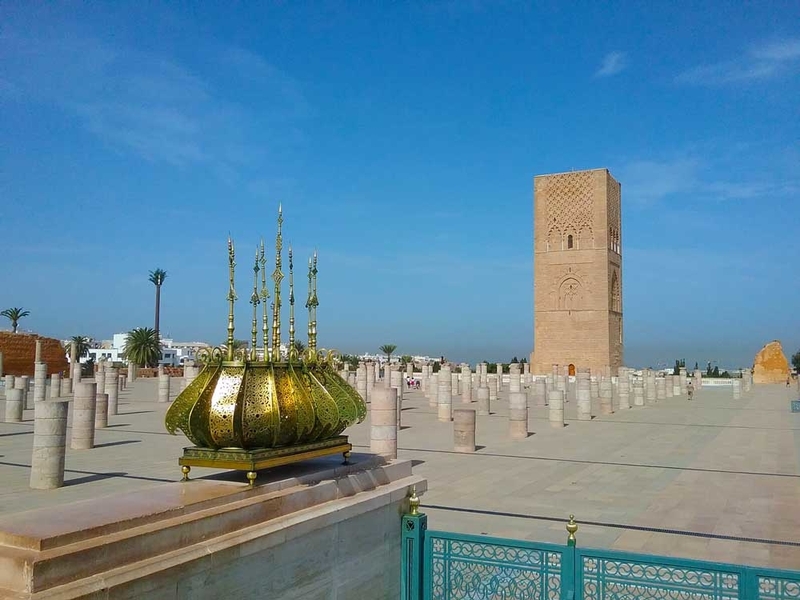 For our busy day, we headed north to Rabat, the capital of Morocco, where we stopped to see the Mausoleum of Mohammed V and the changing of the guard, on horseback, wearing the fez hats and traditional uniforms. This beautiful marble structure is so impressive with the vibrant jewel colors inside and intricate carvings on the ceilings and pediments. On the outside courtyard is the Hassan Tower on one end, with several partial columns that were brought there from Volubilis, an archaeological site of Roman ruins between Meknes and Fez. We continued on through Meknes and stopped to see one of the most impressive gateways in North Africa, Bab el-Mansour. Our final destination for the day was Fez, the country’s oldest imperial city and former capital. While in Fez, we explored the medina and Kasbah, one of the largest and liveliest medieval centers in the world (dating from the 9th century). 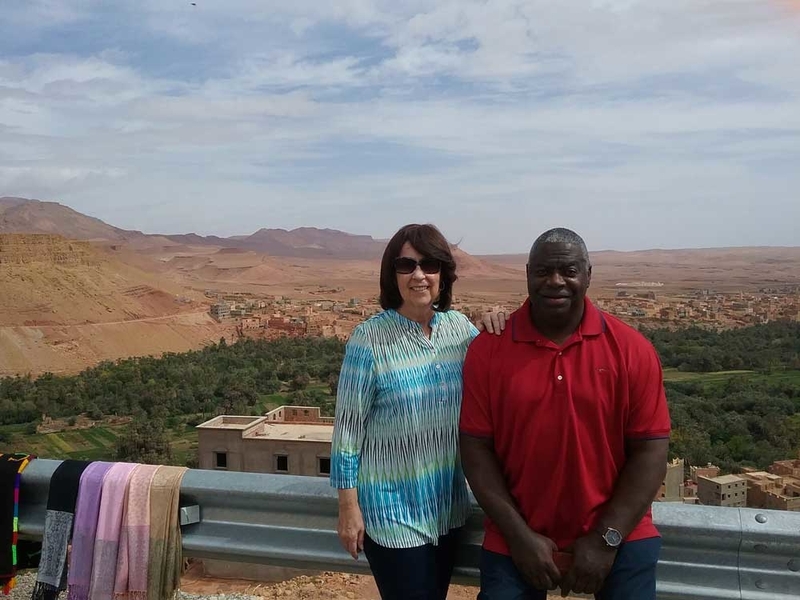 Here we learned from Mo, our Moroccan guide, the Arabic phrase for “Let’s go!” From then on, we excitedly shouted out “Yalla” (Pronounced ya-la) whenever we left the motor coach to explore something new on our trip. Two special evenings in Fez—both in Riads (guest house or small hotel located in the heart of the medina). The first evening was a special dinner with Moroccan entertainment (Moroccan music, a magician, Berber drummers, and yes, a belly dancer). 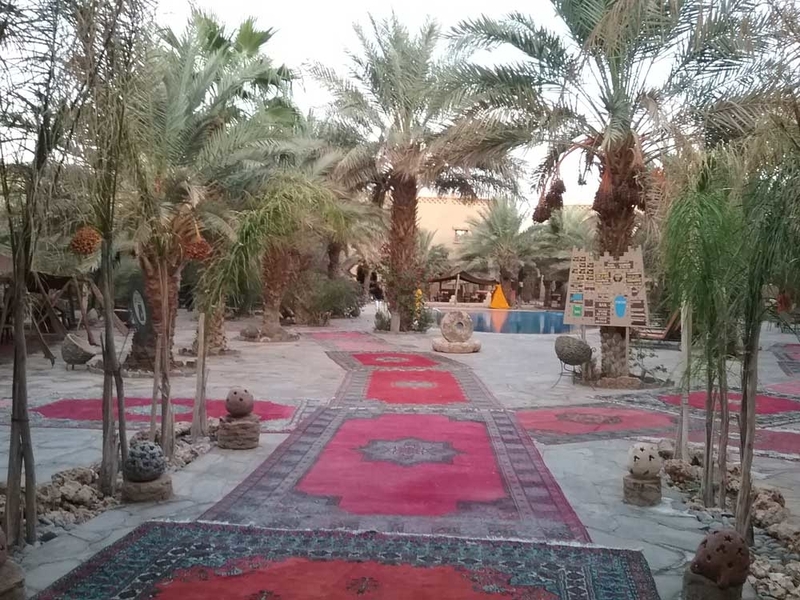 The second evening was a Be My Guest dinner in a beautiful Riad with a central courtyard in the building with a swimming pool and a terrace overlooking the medina. Our dinner was on the terrace with a bright moon shining over our view of the ancient medina. We continued on through the Low Atlas, Mid Atlas Mountains, following the old caravan trail south. One stop along the way was a small village where about 40 Berber families live in caves. We were able to visit one widow who welcomed us in to her home and learned about her way of life. Back on the road again in Morocco With Trafalgar, we saw oases stretching for miles along the way with date-producing palm trees. This path led to Erfoud, our stop for the night. 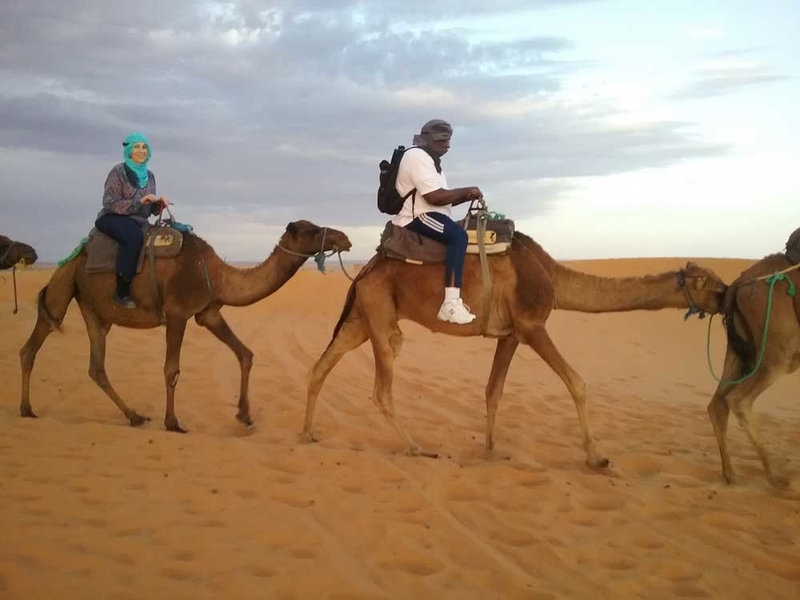 We purchased an optional excursion here to ride out to the big sand dunes of the Sahara Desert, racing to catch the sunset over the shimmering sands. We arrived, learned how to wrap our head and face like the local Berbers, and then got on a camel and rode to the top of one dune to view the sun sinking behind the clouds on the horizon. Our hotel in Erfoud was an authentic Moroccan accommodation. Related: Lowest Guaranteed Prices On Worldwide Trafalgar Tours! Browse Destinations Today! We continued the next day to the Todra Gorge which cuts through the mountains for a very different view of Morocco’s landscape. Another stop was at a Berber family’s tent where we learned more about their nomadic culture and daily family life and customs. Later we arrived in Quarzazate, a bustling small city, where many famous movies have been filmed (Lawrence of Arabia, Cleopatra, Gladiator…). Movie studios are located there but not open to the public. Afterward, we traveled across the High Atlas Mountains, visiting the Ait Ben Haddou, a UNESCO World Heritage Site. We headed west through the Tizi-n-Tichka Pass to Marrakech, the “Red City” (the sandy color of many of the old structures). Another imperial city, it also has the old walled city, the medina, and the adjacent modern city. Much time in Marrakech is usually spent in the souk, Morocco’s largest traditional market place. It is next to the Djemaa el Fna Square (Square of Death). In earlier days, this is where executions took place. When the French were in control of this part of Morocco, they kept the name for the square but did away with the public executions there. Today this is a gathering place for snake charmers, palm readers, fortune tellers, acrobats, camels, musicians, outside eating places—a great place to be entertained. 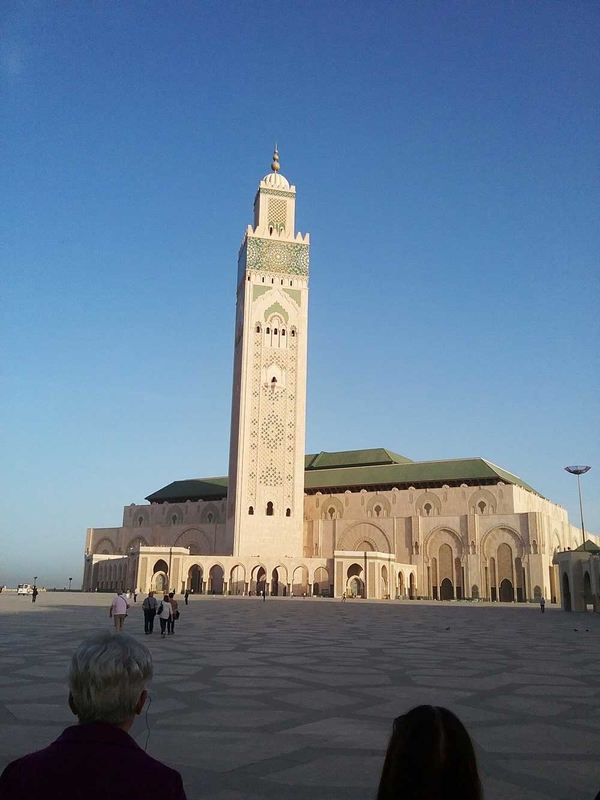 Upon leaving Marrakech, we headed back north to Casablanca. Part of the drive was along the coast where we enjoyed a nice lunch ocean side on the suburban outskirts of Casablanca. On our way to the hotel, we stopped at Rick’s Café to take some pictures on the outside. After a short rest at the hotel, we met to go to our Farewell Dinner at a small restaurant in the downtown district. We celebrated a wonderful tour with our newfound friends, Tour Directors and motor coach driver. As always, it is bittersweet to say goodbye. One last time, “Yalla!” Only this time, we weren’t so enthusiastic to go—this was an adventure that we will never forget. We go home with our memories of Morocco with Trafalgar and can’t wait to feel the excitement of traveling to our next destination. Where Are The LOVE Sculptures Around The World?